In my post The Role of Organized Sports in Your Child's Life, I touched on the importance of not outsourcing your child’s youth sports experience to organized programs. Even at the earliest ages, you can make a positive impact by doing something as simple as playing a game of catch with your child. Regardless of your skill level, a game of catch (i.e. 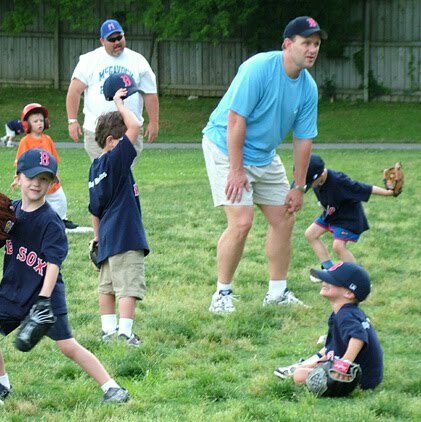 throwing and catching) begins the process of introducing your child to sports. This simple activity helps form an important initial bond between you, your child, and a sports activity. It’s often your child’s first experience having fun "playing ball" with a "teammate." When your child reaches an age where he or she can participate in a developmental youth sports program, don’t forego the opportunity to stay involved. You can still play that game of catch. You can personally teach your child some basic skills. You can also help coach your child’s team in organized sports. What if You've Never Played Your Child's Sport? Some parents are hesitant to offer their services as a coach because they never played the game. They're worried that they lack the knowledge to teach young players the necessary fundamental skills. In developmental programs and leagues, however, you will usually find coaches who are willing to mentor assistants. Just as they do with their youngest players, these coaches are ready to pass on their knowledge to novice parent-coaches. A head coach that fits this description will find a role for you to play within his or her practices. Similar to a beginning player, you should expect that your role will initially be limited. Nevertheless, it will provide you an opportunity to interact with your child and others—and to begin learning the game’s fundamental skills and how to teach them. If you complement this initial coaching experience by reading a few introductory books on your specific sport, you will have acquired the necessary knowledge to coach at the lower levels. Knowledge of the sport you are coaching is a desirable asset for any youth coach. But knowing how to teach and nurture young players is probably equal to or more important than having played the game. (I talk about this in Is Your Child's Youth Coach a Good Teacher?) Books, blogs like this one, online articles, and other resources will help you understand the most important principles and approaches to successfully coaching youth sports. So even if you’ve never played your child’s sport—but believe you have good communication skills, work well with children, and want to get involved—ask your child’s coach if you can become his or her assistant. You may help create an enjoyable, rewarding experience for everyone (including yourself). Hey Jeff. Kudos for encouraging folks to get out there and coach. I do hope they find a mentor. So many soccer clubs are going to professional training, but the good clubs are providing good support for rec coaches who will step up. My site, www.Fit2Finish.com, has some good helps for coaches just getting started. I do find that the inexperienced (but book-smart) coaches tend to talk a lot and not do enough. This is not a good learning scenario for kids as you know. They need to be moving and trying and gathering feedback from their attempts.